Noncoding RNAs, mobile elements, and alternative splicing are all critical for the regulation of gene expression. Here researchers from the University of Science and Technology of China show that a conserved noncoding RNA acquires a new function due to the insertion of a mobile element. They identified a noncoding RNA, termed 5S-OT, which is transcribed from 5S rDNA loci in eukaryotes including fission yeast and mammals. 5S-OT plays a cis role in regulating the transcription of 5S rRNA in mice and humans. In the anthropoidea suborder of primates, an antisense Alu element has been inserted at the 5S-OT locus. 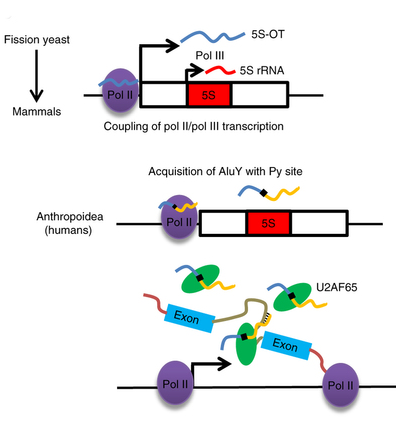 We found that in human cells, 5S-OT regulates alternative splicing of multiple genes in trans via Alu/anti-Alu pairing with target genes and by interacting with the splicing factor U2AF65. This trans effect of 5S-OT in splicing might be exploited in biotechnological applications. Model for the evolution of 5S-OT in eukaryotes, its cis function in regulating the transcription of 5S rRNA in mammals, and its trans roles in modulating alternative splicing in humans.